docs24 platform provides digital brand management with local printing for global companies. The docs24 platform is connected to our pre-vetted global network of print suppliers to have the materials automatically routed to the best suited print partner closest to the delivery destination. By printing locally we reduce transportation distances and costs by up to 90% and secure fast delivery times, 2-3 business days to most countries. Studies show 5-10% of staff members are involved in managing printing, spending a lot of time coordinating with internal stakeholders, print houses and couriers, especially when shipping prints globally (adding the complexities of customs etc). 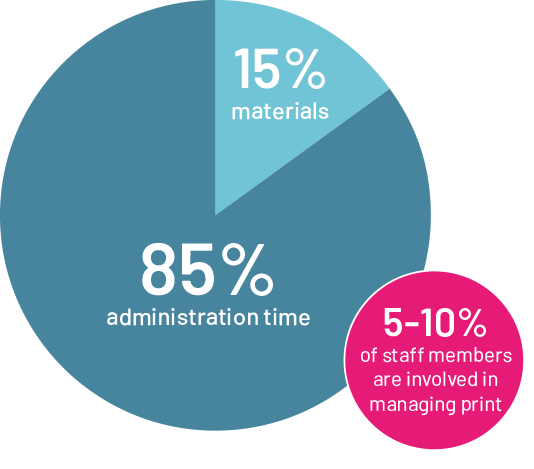 85% of total cost of printing is connected to admin time when managing a print order (less than 1000 items). docs24 helps eliminate these issues, giving you back valuable lost time and saving you money. There’s no longer a need to hire professional designers. By using our personalised, editable templates you can cut down on design costs and expensive software technology, giving you and your teams flexibility with complete control. Streamline your communications across multiple channels with docs24 brand asset management platforms. It has never been easier to create, launch and manage campaigns across the mediums of print, email, social media and SMS, all in one place and at the touch of a button.